En-suite bathroom to bedroom 1 with bath, WC, bidet, shower. Family bathroom 1 with bath, WC, bidet, shower. Kitchen with granite worktops, cooker, hob, fridge/freezer, washing machine and microwave. All utensils available. Large upstairs lounge leading directly to a terrace, overlooking the pool. 2 leather sofa, TV, DVD, video player. Some DVDs and tapes. There are stunning beaches all along the Western Algarve. The long sandy beach at Praia da Luz itself is only 5 minutes walk and has every facility from bars, cafes, shops, restaurants, water sports, etc. Many totally unspoiled beaches are to be found along the western coast. Very safe and friendly. 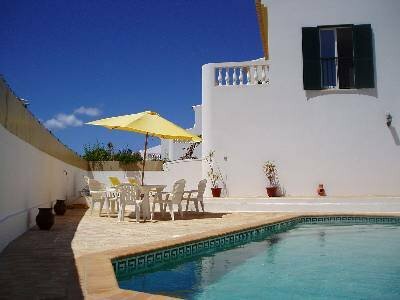 The villa is near the centre of Praia da Luz and you do not necessarily need a car as all facilities are within walking distance. The nicest town on the Algarve, Lagos is just a cab/bus ride away. With its stunning Marina and walled old town. Many golf courses within easy driving distance.